[Image: Para-city by Somnath Ray]. 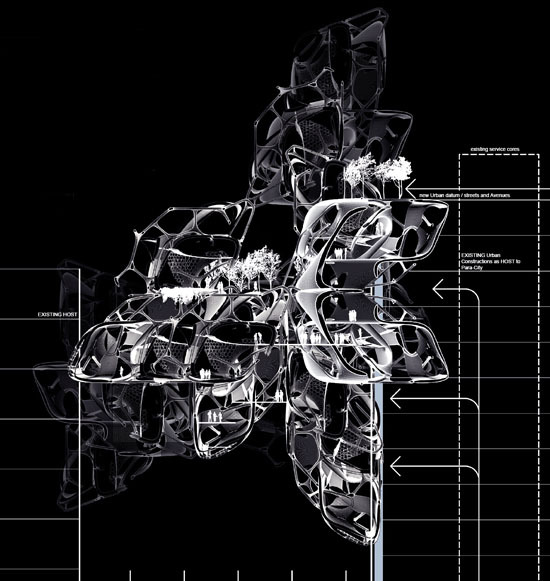 Less of a new building type than a kind of architectural fungus spreading across the roofs and walls of the city, Somnath Ray's design for a "skyscraper of the future" won First Prize this year at eVolo Architecture's annual design competition. Called Para-city, Ray's project is meant to take advantage of the unused yet usable space found throughout the city: the massive corridors of air between the other buildings. "With ever-increasing densities and changing programs," he writes, "Para-city grows in the entire three-dimensional space of its host: the existing skyscrapers of the present urban landscape." For other entries and many more images, be sure to stop by the eVolo Architecture competition site – but beware that it appears to have been designed for the purpose of navigational frustration. Never hit the "back" button. If I was Supreme Ruler of the Universe, I would instantly illegalize the use of Flash. Thankfully, a book featuring all the designs should be out by May 2007. 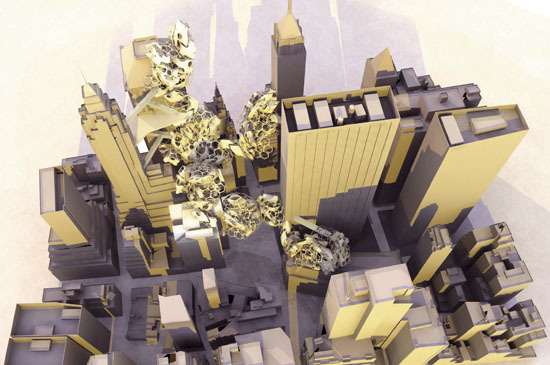 (From last year's competition: Skyscraper Futures: Infected Design). uhhh, haven't we seen this before? oh yeah - lebbius woods. Gosh, that's a horrible site. How did you get the high quality images from there? That also implies you could read the text on them too... so how? Aegir - I was in touch with Somnath Ray himself and he sent me some JPGs of the project. Unfortunately, there's really no way to read about the actual projects on the website itself - or at least not in any sustained sense - which is another reason why that website is so terrible! Surely, being able to read about the projects is an important part of their presentation? Barry Lehrman- The critical point of difference for this Project from Lebbeus Woods’s work lies in the very instant of their origins… Lebbeus Woods’s work, although similar in its imagery regarding alien bodies that penetrate the more familiar surroundings originates in an apocalyptic dystopian view of society as manifestations of violence and accident. (although ironically an aestheticized version of that terrible fate). Para city is explicit as a version towards a progressive Utopia that seeks a ‘play’ between the totalizing Form of the city and Organicist Individualism. The ‘play’ suggested here has its origins in the idea of the ‘event’; “ the moment of erosion, collapse, questioning, or problematization of the very assumptions of the setting within which a drama may take place-occasioning the chance or possibility of another, different setting.” [as described by Foucault and further incorporated into the architectural discourse by Tschumi (Architecture and Disjunction Pg 256)] The future of architectural utopia is imagined in the facilitation of such play, implying a constant rupture and its immediate resolution… ad infinitum. An infinite feedback loop of perpetual anguish and its continual absorption.